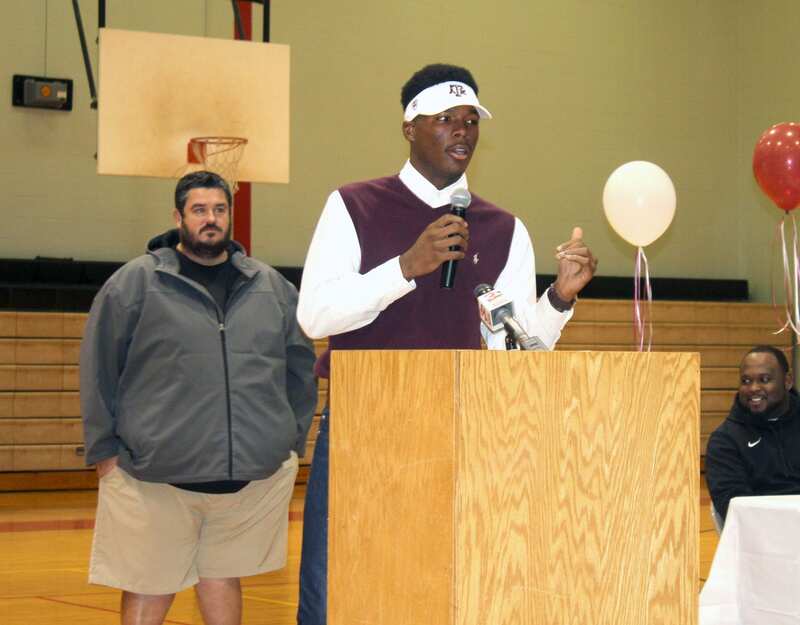 Plain Dealing football standout Keldrick Carper signed a financial aid agreement with Texas A&M during a ceremony Monday morning in the school’s gym. The 6-foot-3, 190-pound Carper played a variety of positions at Plain Dealing over the past four years including quarterback, running back, wide receiver and defensive back. One of the top recruits in the state in the Class of 2017, he could play wide receiver or defensive back at A&M. Carper helped Plain Dealing reach the quarterfinals of the Class 1A playoffs this season. The Lions upset No. 4 seed Oberlin 14-6 in the second round before falling to No. 5 Oak Grove 46-20 in the quarterfinals last Friday. Carper is a two-time All-Parish selection and was one of the MVPs on last season’s team. He was also named first-team Class 1A All-State. Carper is also a standout basketball player and track athlete. He was a first-team All-Parish basketball selection last season. As a sophomore, Carper was named Outstanding Performer in the Class 1A track and field meet in Baton Rouge. But he will not be playing basketball or competing in track and field this season. Carper is graduating from Plain Dealing in December and enrolling in Texas A&M in the spring. Carper thanked his parents, teachers, principal and anyone else that has helped him along the way during the ceremony. He also thanked Texas A&M head coach Kevin Sumlin and secondary coach Terry Joseph, who recruited him. Carper also offered his classmates some advice at the end of his speech. “Be diligent in your craft, work hard — work, work, work,” he said. “Nothing comes easy in life; you have to work for it. Have confidence in yourself. Believe that you can do it. You have to have confidence in yourself or nobody else will.